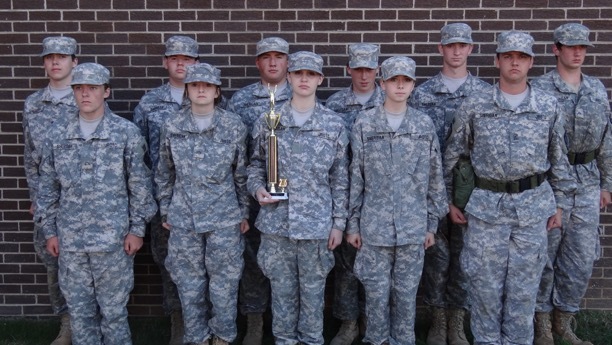 Sheridan High School's Army JROTC recently competed in the Malvern Raider Challenge Invitational in which the Sheridan Raider Challenge team placed second in four of the six co-ed events. Seven Sheridan High School students competed. The events included a Pentathlon, Obstacle Course, Physical Fitness testing, Orienteering, Teamwork events, and Tug of War. Back row, from left Jacob Wawrzynek, Jessie Scarlett, Brandon Hargis, Christopher Moore, Tyler Pratt and Nathaniel McDorman. Not pictured: Kaleb Rowell, Samuel Squires, and Gavin Maxwell.